The Grand Village Shops is the perfect place to enjoy great shopping in Branson. With over 20 locally owned shops, there is something for everyone in this great shopping spot in Branson. While shopping in this fascinating place, you’ll get to see singing waiters entertain shoppers while they enjoy diner style food and scrumptious ice cream from the soda fountain at Mel’s Hard Luck Diner. 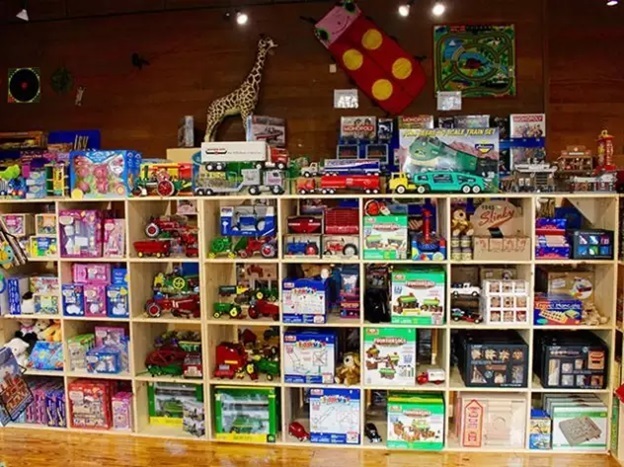 If you want your kids to see an array of collection of old toys, bring them to Back In Time Toys at the Grand Village Shops where they are sure to enjoy one of a kind shopping in Branson. Back in Time Toys at the Grand Village Shops in Branson is a vintage toy store that buys and sells classic toys. They carry nostalgic toys such as pedal cars, vintage board games, classic toy figures, and more. They also carry new name brands like Melissa & Doug and Fisher Price. When you visit this toy store, you’ll travel back in time to your childhood memories and you can make new ones with your children and grandchildren. Back in Time Toys was started by Jon Morris in 2013. With Jon’s love of unique toys, it spurred him to take his love for collecting old toys and turn them into something bigger. When Cole Camp first opened, they weren’t sure what to come next. The store had both vintage and new toys but all old fashioned. No cell phones, computer, or video games in there. But it turned out to be an exciting adventure. People from all over come to see what they have and even bought toys from their childhood. A real great place to reminisce and buy unique gifts. Back in Time Toys grew even more in 2015 and soon a new opportunity presented itself in Branson. After the TIA fair in New York in February, Jon found a place at the Grand Village Shops and he knew it was the perfect place. Immediately toys were ordered, displays built, and staff hired. Back in Time Toys in Branson is a dream come true for Jon. Many people from many different places visit Branson and now Back in Time Toys too as well. The store hopes to continue to bring your favorite and memories to you in many locations. Dickens Gift Shoppe is another great store to visit at Grand Village Shops which features jewelry, scarves, lawn and garden, and souvenir items. Dickens Gift Shoppe is more than just a souvenir shop. They also offer jams, jellies, and other sweet treats including their famous Cream and Butter Fudge. They have all the best flavors featuring Tiger Butter, Snickers, and Mint Chocolate Swirl, just to name a few. They also make Sucrose Free, made with Splenda. So, if your kids want to see an array of classic toys and travel back to their childhood memories, bring them to Back in Time Toys at the Grand Village Shops in Branson.